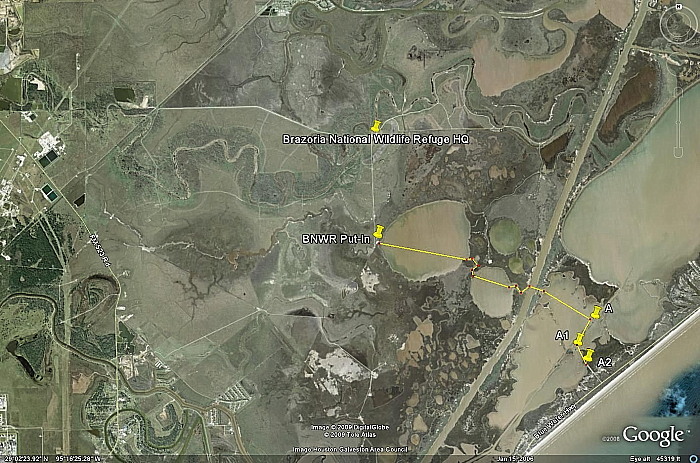 Trip Description: Meet at 9:00 a.m. to put in at 9:30 a.m. on a shell beach in Brazoria National Wildlife Refuge. Paddle two salt lakes (3 miles). If conditions permit, cross the Intracoastal Waterway into Drum Bay and paddle to a lunch stop at a beach. Round trip will be 10 miles. The launch site has good parking and a spacious clean porta-potty, last time I was there. The Visitor Center at the HQ has good facilities and information also. This trip has a nice variety of coastal lake, marsh, ICW, and bay and is usually a good bird trip. There are a couple of areas with oysters, depending on water level, so consider whether you're willing to risk scratching your fiberglass boat. Driving Directions: From Houston, Head south on Hwy 288 towards Angleton and Lake Jackson. Exit at FM 523 South and go left (south) on FM 523. Go 14.5 miles and turn left at Hoskins Mound Road/CR 227. Go 1.8 miles and turn right to the refuge. Go about 3.1 miles and turn right immediately before the visitor center onto a shell road called something like "Salt Lake Road". Go 1.5 miles due south to a shell parking area. ~60 miles from downtown Houston. Trip specs: 8 - 10 miles, up to 5 hours. Trip Rating 2. Be ready to launch at 9:30. Hazards: Put-in ramp can be slippery. Water depth should be adequate but shallow areas do have some oysters, so you might consider your plastic boat. LIttle boat traffic on the lakes but the Intracoastal has a few MAJOR barges and work boats. If we cross the Intracoastal, we will stay together and give them LOTS of room. Always remember to dress in layers as if you might go in the water. NO COTTON! Bring lunch, sunscreen, plenty of water, and insect repellent. Ready to Launch at 9:30 a.m.
Latest Expected Return 5:00 p.m.